When talking about the pension problem in Illinois, everyone focuses on the $100 or so billion underfunding. But the problem is not just the underfunding, it’s the amount the state needs to contribute to the plans each year to move them toward solvency. Take a look at the following chart, comparing the Gross State Product, taxes and pension obligations of Illinois and Florida. Illinois and Florida have similar GSP’s, the two states have similar size pension plans, and Illinois collects 20% more in taxes than Florida as a percentage of GSP. The foreign object floating in the punchbowl is found in the last column. Whereas in 2013 Florida had a pension contribution of $2.61 billion, or 5.5% of total state taxes, Illinois required contribution of just over $7 billion amounted to a full 19% of all state taxes collected. While these figures are from 2013, they haven’t gotten any better in the past 2 years. For fiscal 2016, Illinois’ contribution is $6.8 billion. And that contribution is supposed to come out of a budget that anticipates $32-$33 billion in revenue. When one out of every 5 dollars raised in taxes goes first to fund pensions, there’s no way that any other department of state government can be funded at requested levels. From 2011 through 2013, taxes collected by the state increased almost 25%, and the funding ratio of our pension plans declined by 4%. The only way we’re going to climb out of this mess is to expand Illinois’ economy and put more people on the tax rolls. That’s only going to come through systemic changes to the way we do business in this state, and that will only come when we have real workers’ comp reform, abolition of the prevailing wage and a release of the stranglehold that public sector unions and their truffle pigs in Springfield have over us. This entry was posted in Illinois Budget, Public Pensions and tagged Illinois Budget, Public Pensions, Taxes. Bookmark the permalink. One practical action can be taken immediately. In 2016, Obamacare ‘Cadillac Policy Excise Tax Penalties’ begin. 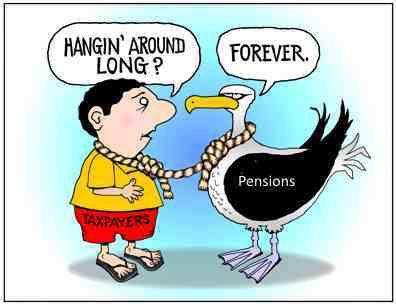 While Illinois Constitution may protect the right to pension benefits in all forms, I do not see language requiring taxpayers to guarantee all TAX PAYMENT OBLIGATIONS related to these guaranteed benefits on behalf of benefit recipients. Therefore, the new excise tax fees on Cadillac Plan benefits for public employees seem to be the legal obligation of the individual recipients, not the taxpayers. I have seen no discussion about whether teachers, County Board members, etcetera have been informed of this new impending obligation, and whether their reaction might be to choose lesser-expensive plans (Obamacare Silver) rather than personally paying thousands of dollars excise taxes on current Cadillac-level plans (excise tax penalties are not even tax-deductible to the recipients).